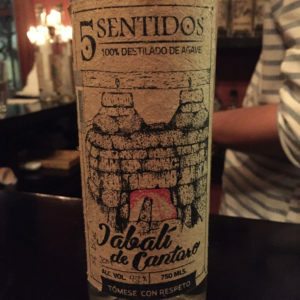 Cinco Sentidos (5Sentidos) is the house mezcal of a restaurant named El Destilado in downtown Oaxaca. The restaurant was founded in 2015, and it’s quickly become one of the more popular stops for tourists from all over Mexico and abroad. El Destilado started as a mezcaleria that featured a curated mix of some of the more rare and obscure mezcals from throughout Oaxaca. Soon after opening, they developed a menu of contemporary cuisine that is both unique to the Oaxacan food scene and also highly acclaimed internationally. As of the writing of this post, El Destilado is one of the top ranked Trip Advisor Restaurants in Oaxaca. In 2017, Cinco Sentidos became available in the US for the first time. As of the writing of this blog, the nano-batches they ship to the US come from four different producers and the batches generally range from just 50-150 bottles each. The name Cinco Sentidos was chosen for the brand because all of their producers use nothing but their five senses when producing mezcal. They’re not using any modern instruments or tools to gauge ABV or anything else in production. 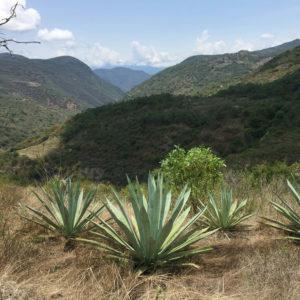 Their small-batch producers work in some of the most remote areas of Mexico, and they do not certify their mezcal with the Consejo Regulador del Mezcal (CRM). As seen on the bottles pictured below, they label their mezcal Destilado de Agave not Mezcal. 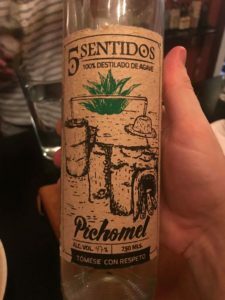 5Sentidos Pichomel made with a rare agave Marmorata sub-varietal. The back bar at El Destilado. 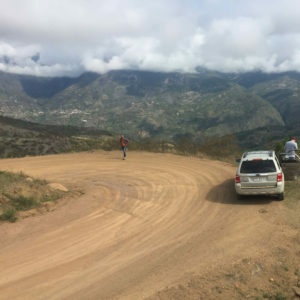 On our most recent trip to Oaxaca, Jason, co-founder of both El Destilado and Cinco Sentidos, took us to visit one of the Cinco Sentidos producers. Jason was a Peace Corps volunteer in Panama and he originally moved to Oaxaca to continue learning Spanish so that he could become a certified court translator in Washington, DC. Little did he know he’d quickly become entranced by Oaxacan culture, food, and spirits. While some brand owners like to have influence over the mezcal their producers create, Jason prefers to “let art be art.” He trusts the dedication and generations-old knowledge of the producers he works with and therefore doesn’t interfere with their processes and production. That said, he visits all of them (including those whose mezcal is only available at El Destilado) two-to-three times a month. Given they all live several hours outside of downtown Oaxaca, that makes Jason a very busy guy. Jason took us to visit Alberto Martinez in the remote town of Santa Catarina Albarradas. Alberto and Jason originally met at the El Destilado restaurant. Alberto had come to downtown Oaxaca to sell 30 liters of mezcal to famed mezcal tour guide, Alvin Starkman. Alberto had taken public transit from his remote village, which takes 4-5 hours, but he was unable to connect with Alvin in time. With no one to sell his mezcal to, Alberto went to El Destilado and met Jason for the first time. After tasting it, Jason bought the entire 30 liter batch. Though Jason always visits the palenque of a producer before purchasing, Alberto’s mezcal was so good that he made an exception. He purchased it and went out to Alberto’s palenque later that week to confirm all he’d been told. Santa Catarina Albarradas in the distance (Can’t see it? It’s tiny) with Jason in red. 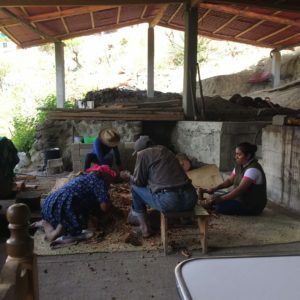 The family crushing Tepehuaje bark at the palenque to aid in fermentation. The town of Santa Catarina Albarradas is built into the side of a mountain deep in the Sierra Norte, about an hour from the nearest paved road. Alberto’s palenque sits about two-thirds of the way up the mountain, at around 6000 ft above sea level. Alberto greeted us when we arrived and he walked us through the palenque where they had a batch of freshly cooked Jabali-Tobala ensamble smoldering in the underground pit oven. 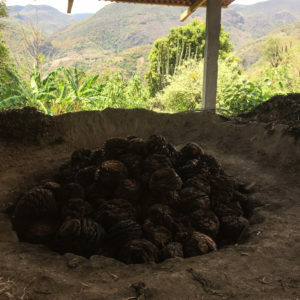 His son-in-law Reynaldo, who will take over production in the next 5-6 years, was working with a few others on mashing the cooked agave with an ax and wooden mallets. 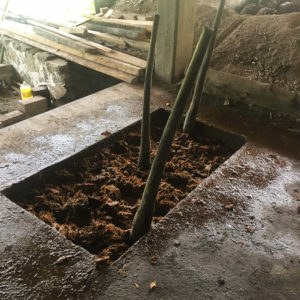 Another four or five family members were also in the palenque, breaking apart the Tepehuaje bark that Alberto adds to the crushed agave to help with fermentation, which is difficult at such a high altitude. A fresh batch of Alberto’s Jabali-Tobala Ensamble in the oven. 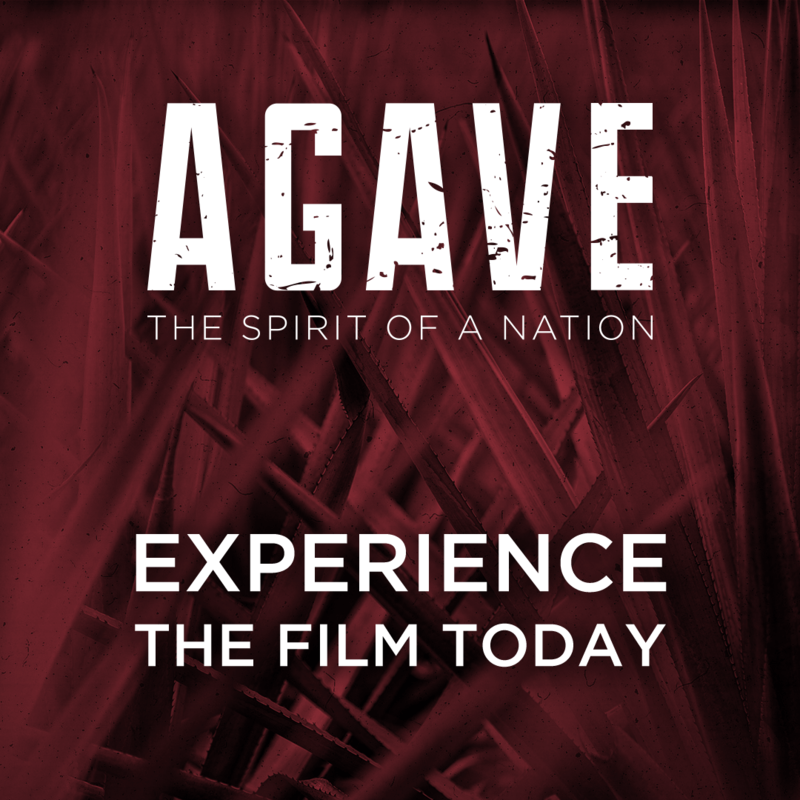 The agave are milled by hand with axes and wooden mallets. Though the addition of this bark is not common practice, we’ve heard of other more industrial brands that add chemical lawn fertilizer to jump start fermentation in colder months. Obviously the bark is a much more palatable, organic way to help with potentially slow yeasts. After the bark is taken for fermentation, the wood is used to fire the still and the pit oven. Alberto says his family has been making mezcal with Tepehuaje bark for generations. He can’t imagine it done any other way. He also ferments his agave in large underground cement tanks rather than wooden tubs. 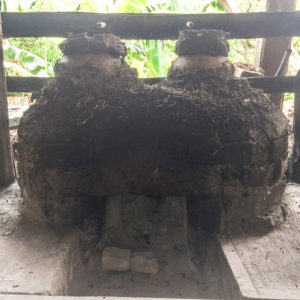 Though many clay pot distillers formerly occupied the Santa Catarina Albarradas area, Alberto is one of the few continuing to use clay pot distillation in Sierra Norte. Most other mezcaleros in the region switched to copper stills years ago. The clay pots he uses are much smaller than those you’d see in Santa Catarina Minas, and a picture of Alberto’s still can be seen on the front label of the Cinco Sentidos releases that come from him (Sierra Negra, Jabali-Tobala , etc…). All of the images on the front label of Cinco Sentidos are artistic renditions of photos that Jason takes while at the palenques of each producer. Alberto’s clay pot still. You’ll see a drawing of it on the label of his bottles. 5Sentidos Jabali de Cantraro, rested (post-distillation) in small black clay pots for 56 days. Notice the drawing of his still. Alberto works mostly with agave Tobala, Jabali, and Sierra Negra. He walked us up to one of his mountaintop Sierra Negra fields, which had amazing views on all sides. 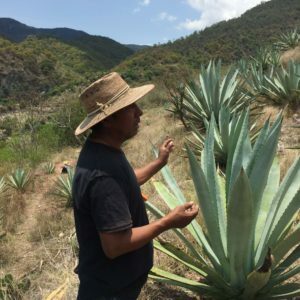 According to him, semi-wild agave Sierra Negra is easier for him to find than agave Espadin, which is what’s used in 90% of mezcal coming from other regions. The agave that he calls Sierra Negra may in fact be agave Arroqueno, but that remains up for debate. Maestro Mezcalero Alberto Martinez with his agave. Alberto’s agave growing at 6500-7000 ft above sea level. The overall feeling was that Alberto is deeply committed to his craft. Mezcal production has engulfed his entire family and Alberto has done a great job of making his family’s mezcal more of a full-time practice. Though his family has made mezcal for generations, he’s the first mezcalero in his family to own a palenque for himself (rather than renting space), which is a big point of pride. 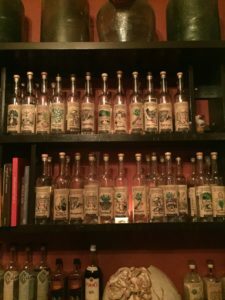 Though there are limited batches from Alberto Martinez in the US, his mezcal is readily available at El Destilado. Make sure to make a reservation in advance. Amazing to see the labor, love, and time that goes into making such a wonderful product such as this mezcal. I sincerely hope that this will be able to be preserved for future generations.